2)Genraly Third House belongs to strength,Younger siblings, short travel, communication. Ketu belongs to disattchment,harsh, etc. 3)Strength—–Ketu belongs to concentration so when ketu In 3rd House native have great own concentration regarding strength means native is very brave and courageous.Native is very strong in physical strength and also in Mental strength. As when native is very concentration regarding own strength then definitely gives fear regarding own weakness. Enemy get fears from Native.Ketu In 3rd makes native very active. As native is quick in activities so native may be good player. 4)Younger Siblings—–As ketu is natural Malefic so 3rd House ketu is Malefic regarding Siblings. Ketu belongs to detachment so there is detachment between native and siblings.If ketu is not well placed then it proves very bad regarding siblings. 5)Travel—Ketu In 3rd indicating native may be go for a lot of travel it may be short ,long or medium depanding on chart. Some time it may cause for Forigen travel. 6)Communication—-Third House ketu indicating native is very harsh way to communicate other. They are very quicker and volatile in communication. 7)As ketu is placed 12th from 4th house (Mind and Thinking mind House) so native may be a bad habits regarding Misunderstood of matter . So Native may be suffering from mental stress. 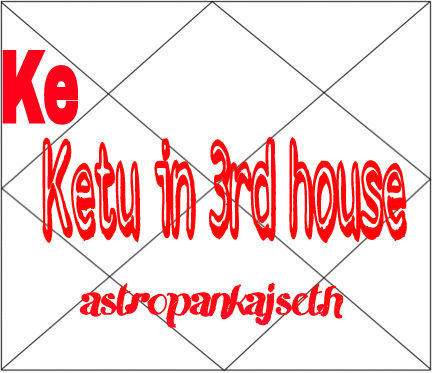 8)3rd House Ketu indicating Native May be rich and earn good wealth and May be good name of fame.